With winter solstice tomorrow afternoon, it’s getting late to be calling this autumn. There are still fresh vegetables in the ice box and plenty of ideas for what to do with them. On Monday and Tuesday I binged on YouTube videos about street food in Pakistan and India, which led me to make a batch of egg fried rice. To begin, I am shocked by how much oil or butter is used by these street vendors. It is well known that restaurateurs use a lot of butter in cooking. Eating in diners accepts a high level of saturated fats in food. But these videos? Oh My God! A quart of vegetable oil? Two or three cups of butter? It’s enough to give a person a heart attack… literally. In an American home we don’t use so much cooking oil yet there are lessons to be learned here. I got out the wok and spent about half an hour prepping vegetables. 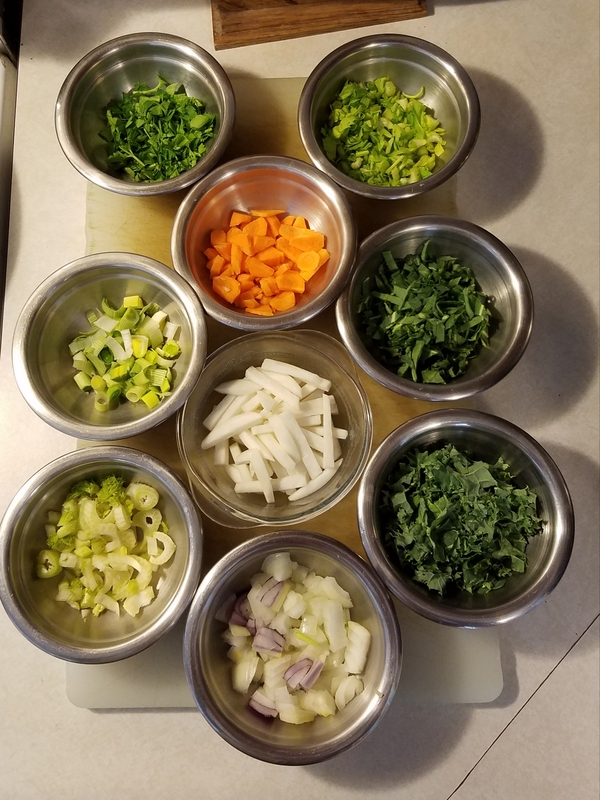 I found parsley, carrots, onion, celery, turnips, kale, collards, garlic, fennel and leeks and diced them up for stir fry. There was about four cups of leftover, cooked rice, enough to use four eggs. If I keep making this dish I need to work on seasonings. I was tempted to add red pepper flakes to the oil in the beginning but resisted the heat to see what the other flavors would lend to the experience. I kept it simple with salt, ground black pepper, ground cumin and smoked paprika. It was good without hot peppers. The rest is pretty easy. Place about four tablespoons vegetable oil in the wok and heat to temperature. Add vegetables one dish at a time in cook’s order (those needing most cooking first) reserving the parsley for finishing. Sauté and stir constantly until the vegetables begin to soften and add the eggs. Street vendors crack eggs directly into the wok, but I beat lightly in a dish and added them all at once. Stir constantly until the eggs begin to cook. Add the cumin and paprika at this point and incorporate. Add the rice and stir until the eggs are cooked and everything is incorporated and heated evenly. Add parsley and serve. Made four generous portions. The kitchen was filled with the aroma of chopped fennel all day. In the finished dish it added a brightness that’s hard to describe. Stirring constantly helped prevent the eggs from creating a crust on the bottom of the wok and made cleanup easier. If I were to serve this as a side dish I’d reduce the number of vegetables to basic aromatics and some greens, maybe add some pine nuts. Stir fry is a flexible dish that can use up what’s on hand. 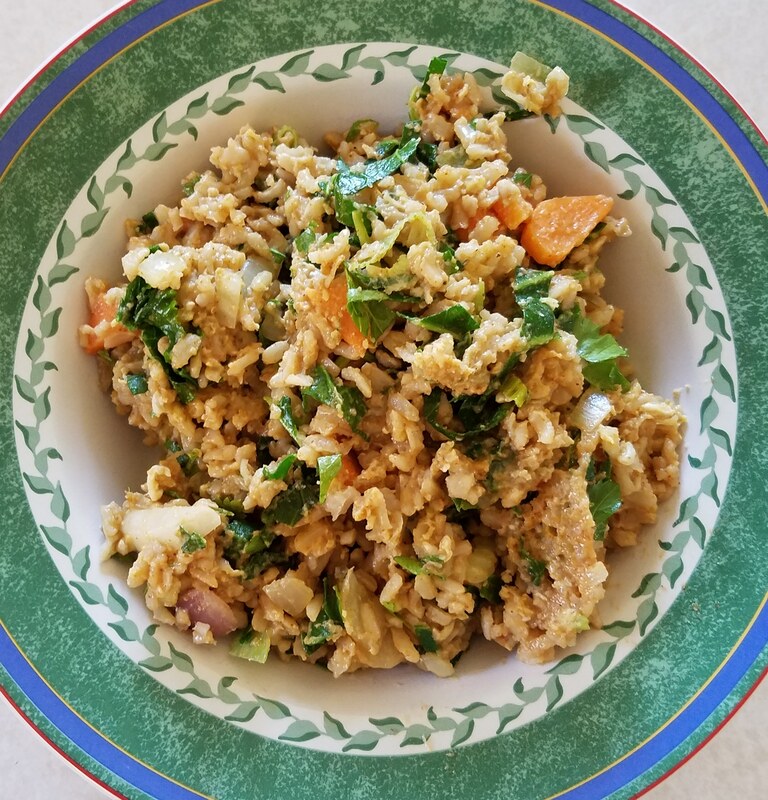 As fall turns to winter egg fried rice helped transition from ice box to pantry for food sourcing. I felt I learned from the experience of making it. In our kitchen, that’s what cooking is all about. This entry was posted in Cooking, Local Food and tagged cooking, farming, Garden, homelife, local food, sustainability. Bookmark the permalink.